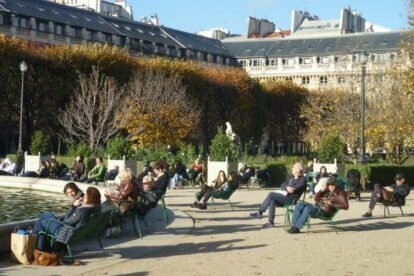 The gardens of the Palais-Royal in Paris are like French people’s minds: at first glance they’re symmetrical, rational, organized… Cartesian. The surrounding buildings are homogeneous, like in Places des Vosges. Everything looks in order. But after a while, you’ll notice a hint of anarchy, disorder, a laid back atmosphere, and sometimes even a big confusion! More Parisian than neighbouring Jardin des Tuileries, also gorgeous but very busy and touristic, Palais-Royal is an excellent place to observe Paris’s upper classes: on weekdays, young executives enjoying their lunch break mix with young nannies and their pushchairs, retired people cross-wording or simply observing life, and young schoolboys playing football and dirtying their uniform in the sandy ground… In the hot season and sunny weekends, you’ll see a more varied and relaxed crowd, including lost or well-informed tourists. I prefer the central pond, mostly for its great chairs (check the reclining chairs article). But the flowered areas with benches are also nice and quieter. Sometimes, exhibitions of contemporary sculptures are displayed in the gardens, adding a touch of anachronism in this once royal residence. In summer evenings it’s an excellent place to sip a bottle of wine, throw a picnic or play pétanque: garden remains open until its restaurants close. Have a look at the arcades too: its mixture of fashionable and kitschy stores (search the pipe shop and the military decorations and medals ones) perfectly illustrates the contrast between old-fashioned declining grandeur and modern vitality of Palais-Royal and its surroundings.